Dr. Roberto Reyes-Barrera, a professor of international trade law at the Vrije Universiteit Brussel (the Free University of Brussels), explored possible cooperation in international trade law, economic law, and trade negotiation training in a meeting with Dr. Amir Khalil, the external academic relations officer at Birzeit University, on June 12, 2018. 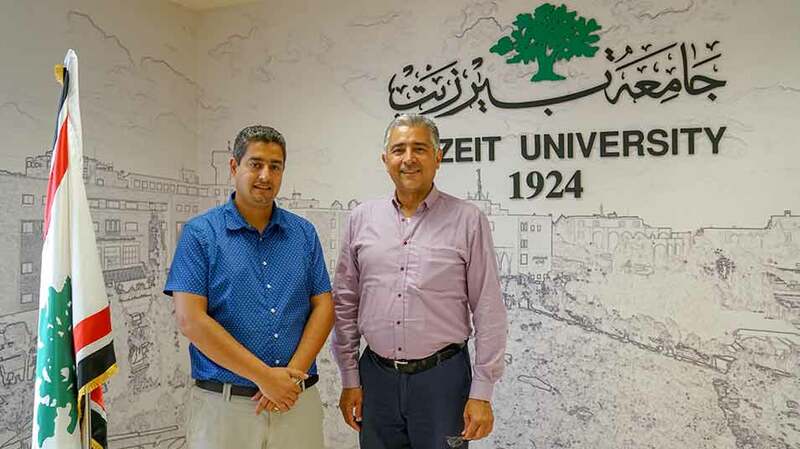 In a five-day visit to Birzeit University, Reyes-Barrera discussed with Khalil ways to expand academic exchange opportunities and research efforts and met with Dr. Mohammed Alqaisi, director of the Master’s in Law Program at Birzeit University, to review and expand upon the program’s course offerings. Reyes-Barrera, along with Dr. Mahmoud Dodeen, assistant to the dean of the Faculty of Law and Public Administration, examined the possibility of establishing a future joint diploma program in trade law. Previously a member of Mexico’s vaunted European Union trade negotiations team, Reyes-Barrera used his experience in international trade laws and discussions to formulate plans for future training courses, workshops, and lectures with Dr. Diab Alshikh, a professor of law at Birzeit University. “Palestine needs a strong team of international trade and law experts to negotiate on its behalf at the World Trade Organization. At Vrije Universiteit Brussel, we employ a combination of strong theoretical basics supported by practical training courses and workshops. With this level of cooperation between the two universities, we hope to bring that model to Birzeit University,” said Reyes-Barrera.